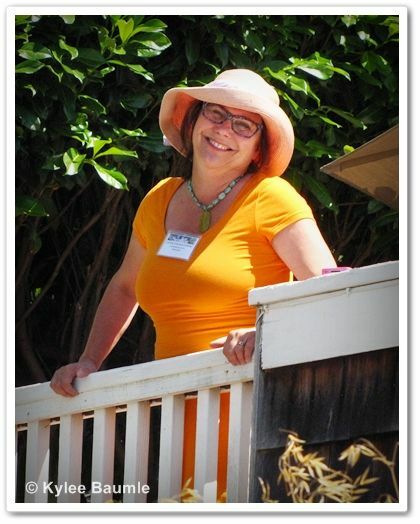 I had the pleasure of meeting Lorene Edwards Forkner and visiting her garden in Seattle last summer, when I attended the Bloggers' Fling held there. 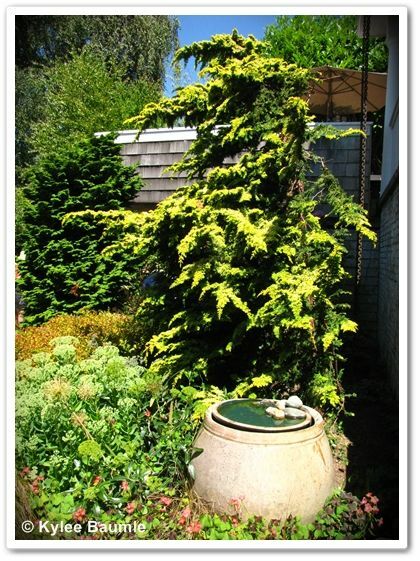 The entire event was fabulous - my first visit to Seattle and the Pacific Northwest - and it was a treat to see so many wonderful gardens. If you've ever met Lorene, you know that she's a bundle of energy and you rarely ever see her without a smile on her face. 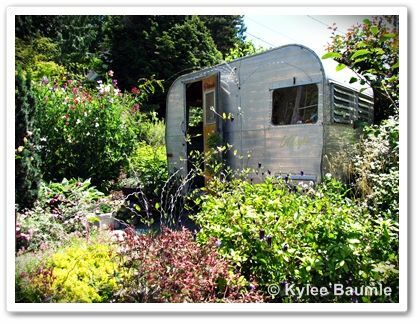 Her gardens reflect that energy and her creativity shines in all the personal touches she put there. 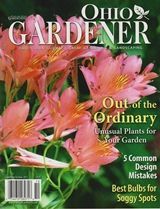 Many of those things I saw in her garden are illustrated in her new book, Handmade Garden Projects: Step-by-Step Instructions for Creative Garden Features, Containers, Lighting & More. How can one person come up with so many unique ideas? I'm not kidding. This book is crammed with them. And there isn't a single one that is difficult to pull off. She gives excellent and easy-to-follow instructions for each little thing. 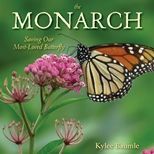 I liked it when I saw it in her garden and I was glad to see it in her book. And then there are homemade fireflies. So cute! She uses LED lights, coin batteries and magnets. I really want to know how she thought of this. 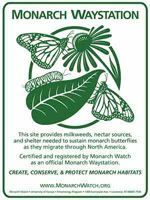 Brilliant, when placed on magnetic surfaces, such as shepherd's crooks. There are trellises and fountains and stepping stones and objets d'art. There are things I never would have thought of in a million years. A turf tattoo??? Seriously. How-tos for this old world water fountain are in the book. This is really a fun book. Timber Press sent a copy to me free of charge and they're going to send one to one lucky reader of this blog, too! All you have to do to enter the random drawing is to leave a comment here, telling me if you have ever handmade anything especially for your garden and what it was. 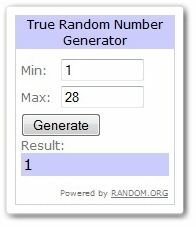 I'll use the Random.org random number generator to choose a winner from all the entries. Be sure I've got a way to contact you if you're the winner. Giveaway ends at midnight EDT, on Monday, May 21, 2012. You can have more chances to win at these blogs, which are also part of the virtual book tour. Not all blogs are doing a giveaway, but they're all raving about the book! Lorene's "Field Office." Isn't this fun? WINNER!! According to Random.org, it pays to be prompt! Laura Thomas, you win! Please email me through my profile and let me know your shipping address so I can provide it to Timber Press. CONGRATULATIONS! And thank you to all who entered. More giveaways to come! What a cool book! I love upcycling or reusing everyday items as art in the garden. I have an old stump that was cut clear off the ground, but I kept it because of the neat look it had from where the tree had grown through a metal chain link fence. Now in it's new home in a perennial bed, it has a raw and a unique look. A great addition to my garden! That looks like a fun book! I love a little whimsy in the garden and re-purposing items for the garden! 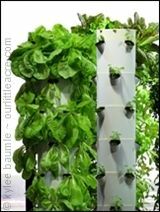 No- I've never made anything for my garden-maybe you could count the bean tower? 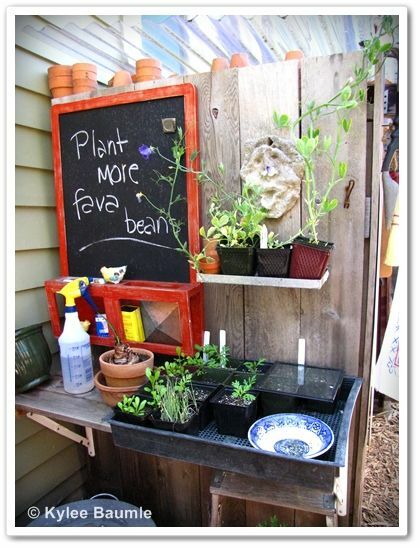 But that potting bench- what a neat idea. They all look like neat ideas! This sounds so fun! And your review makes me want to read it! And have one! Just this morning on my way to work I was contemplating a "new" design for a garden trellis. I got my wife a climbing rose bush for her gardens and as I thought last night about where to plant it, I decided it would need something different to climb on. Last year I made two trellises that turned out nice and she loves dearly but this book may just give me the idea I need to create something new and wonderful. Please enter us for the drawing. What a great book! I love using "found" objects in my garden. I have a "shoe" garden that is made with my family's old shoes and boots. Each one has a different plant growing from it and it reminds me of the kids growing up. I have also used my girl's toddler bed (made of metal) to make a "flower bed" for one of my gardens. It looks like the bed has a beautiful quilt on it when it blooms! I would really like to win this book!! I REALLY could use this book! My creativity so far consists of colored rubber snakes my granddaughter got from the dollar store and tossed in among my garlic plants. They do make me smile when I'm watering! I'd love to read this book, my current favorite garden art is an old highchair that I've painted and decorated with flowers that I use for a trellis. I have blackeyed susan vines growing up the legs this summer. I have made banners for the garden. I have also repurposed other items like the teapot flower pot and the bird bath side table. I am in the process of making a mosaic stone. I have taken a medium sized rock out of my yard and I am adding blue stained glass in various colors and blue gem stones in different sizes and colors. Once the grout dries and the stone is sealed, I will be adding this to my landscape. One summer I had so much fun stacking various glass pieces and glueing them together. The pieces really sparkle in the sunlight. I love repurposing items for my garden. I am forever collecting odd metal bits and making things out of them. Once I picked up a captured glass lighting globe done in a dreary amber (not a pretty amber). I knew it was wonderful but hated the glass...it took me a year of looking at it before I had one of those "duh" moments and took a hammer to the glass releasing the fantastic metal globe from its prison so it could become the top of a metal art trellis that now graces my garden. That trailer / "field office" wins the prize in my book! I love that terrarium table among many other things you've shown here - how inspiring! For our garden I collected some old pint-sized mason jars and wrapped wire around the necks, then creating a "handle" so that they could be hung from the trees...pop some tea lights and/or LED lights in them and we've got instant lanterns! They look great, cost next to nothing, and they definitely create some fantastic mood / party lighting in our yard! What a fun book & a creative lady. I would love to win! 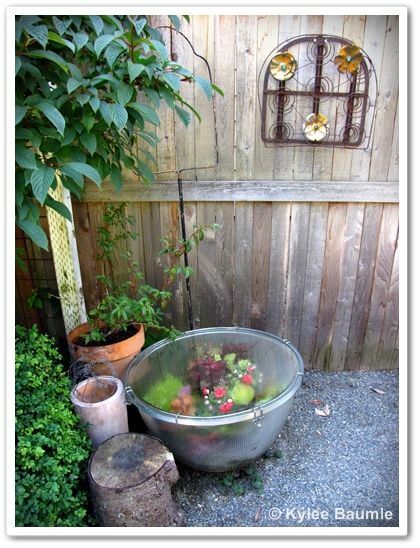 I've done a few popular garden crafts - a bowling ball gazing ball, bird baths & feeders from old containers, ect. My favorite is a platform bird feeder that used to be a roasting pan - not really artistic but I love that it has holes so rain water drains through & makes it so much easier to keep clean. I have made the hyper-tufa pots and love to find new varities of sedum and succulents to plant in them. They look great in the rock garden. Glad to have discovered Our Little Acre. This sounds like a great book. I'd love to win a copy. I did make a wooden bench and 3 planters out of metal buckets for my front porch. I stenciled cute little designs on the buckets and they now have asiatic lilies in them. We made a potting sink/bench out of the old procelain sink we took out of our farmhouse when we remodeled the kitchen.It is my favorite piece in my potting shed.I put a skirt around the bottom and can store my dirt underneath. I am integrating my chickens into the garden this year so I am all about beauty but function. Love the chalkboard idea. I see on in my future. 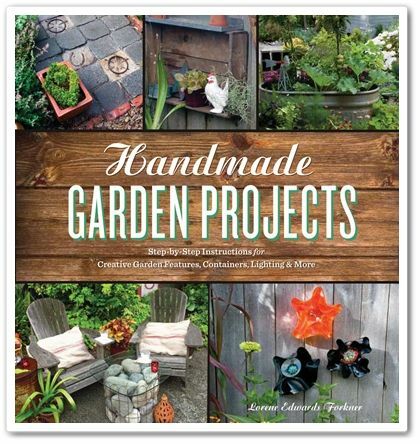 Wow, I love all the projects you've highlighted, this looks like a great book for putting your personal stamp on your garden. I want my own field office, too. Years ago we made small "end" tables from left over cedar from our deck. The deck has been replaced with a patio but the tables live on. I would love to win a copy of this book. 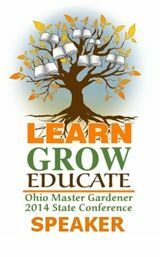 I love getting ideas for adding meaningful art in the garden. My daughter and I took a stained glass class and both made stepping stones for my garden. Her stepping stone is on loan for the day that she has her own garden. Mine was a butterfly stone and her's was a parrot. Very cool! Looks like an amazing read - would love to win a copy of the book. Am in the process of repurposing a winerack and making it into a succulent/edible vertical garden. I used pizza boxes as molds for pouring my stepping stones. They turned out perfect. I love to recycle and I would love to win this book. Lorene is one crafty lady. 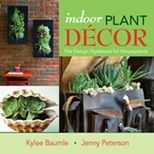 This book looks really interesting - I really like the idea of the terrarium table made from a lamp. Ooooh! I want to win! I got to take a look at a digital galley prior to publication but don't have a hard copy of my own. It's a beautiful book. Pick me, pick me!! !